Sugar shack deluxe pedi party set for 2! enjoy hours of fun with your bff having the perfect pedicure! 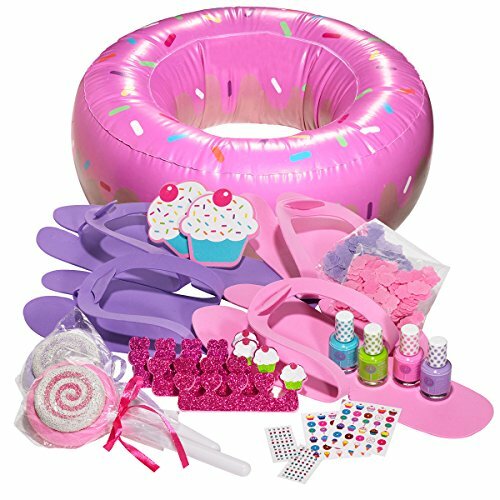 set includes a 21 inch diameter jumbo donut footbath, 2 lollipop foot scrubs, 2 cupcake emery boards, 4 glitter cupcake toe separators, 2 packets of confetti soap, 2 pairs of 'pedi' slippers, 4 (7Ml) bottles of nail polish, 100 sugar shack nail stickers and 200 adhesive gems. Great for sleepovers, play dates and rainy days.